Embedable sign-up forms allow you to feed your public website's visitor sign-ups directly into webElect. In addition to storing the user's contact information and the related groups/tags you assign to each form, webElect attempts to match the user to a voter record and verifies the match with the user. The match is done via name and zip code so no need to require long forms. Sign-up forms are great for building Email Subscriber lists, Volunteer Activity lists, and Issue supporters. Contribution forms integrated with webElect finance reporting integration should be available for testing by July 2017. 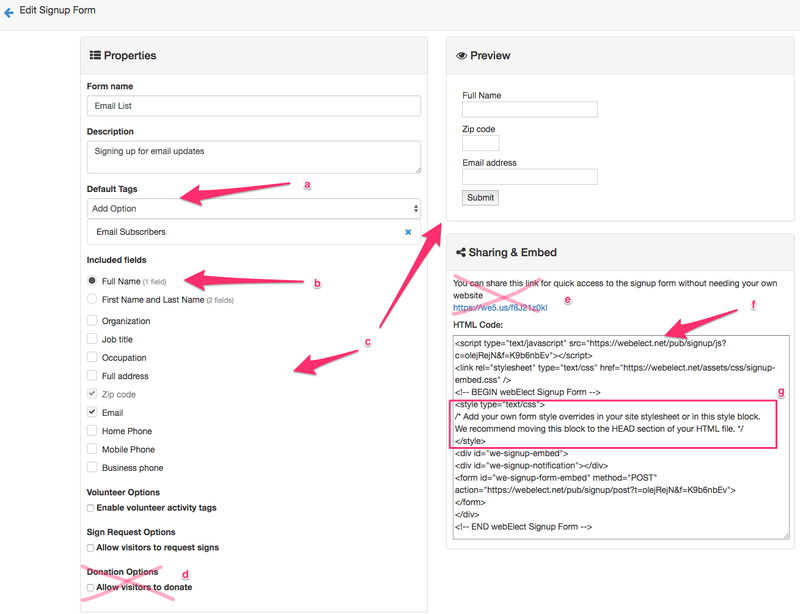 Full name field will automatically parse the name into components making the form shorter. We recommend enabling as few fields as necessary. webElect will attempt to match the signup to a voter record using name and zip code, then confirm the match with the user. Having a match to the voter record provides you with all the additional information from it. 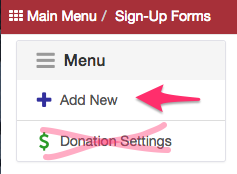 Donation feature is not currently usable. Quick sharing link is not currently usable. After saving the form, you will be provided with the HTML code to insert into your website source code. Copy and paste the code where you would like the form to appear. You will need to provide the CSS styling to the form in order to make it match your website. 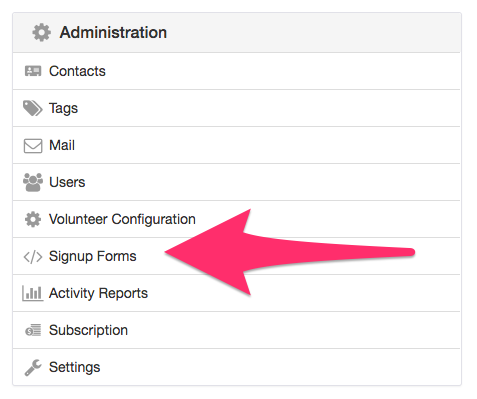 4) The Signup Forms list shows all the forms you have created and the number of signups for each. The number of submissions. Yellow = new/unproccessed, Green = processed. Inbox shows you the unprocessed submissions ready for review. You must accept the submissions before they are saved in your "live" data.